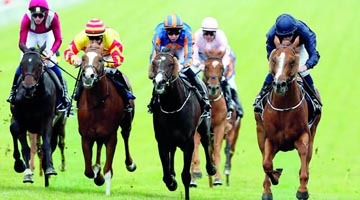 The first, second and third home in the Epsom Derby renew rivalry on Saturday in the Irish Derby at the Curragh. Ruler Of The World defeated Libertarian and Galileo Rock last month but connections of both horses are optimistic that the more galloping track will give them a good chance of turning the tables. Ruler Of The World was only considered the second string of Aidan O’Brien’s five runners at Epsom but he was driven out to a one and a half-length victory by Ryan Moore. He had previously won his trial easily at Chester and is unbeaten in three races. Runner-up Libertarian runs in the all blue colours of Godolphin having been purchased following his fine effort at Epsom. This will be his last race in the care of Elaine Burke before being transferred to Saeed Bin Suroor’s Newmarket stable. Libertarian was finishing best of all in the Derby and has the make and shape of a St Leger horse. Cape O’Rushes will act as a pacemaker on Saturday in the hope that it brings Libertarian’s stamina into play in the closing stages. Another horse that may benefit from a fast pace and a more galloping track is Galileo Rock who finished third in the Derby. 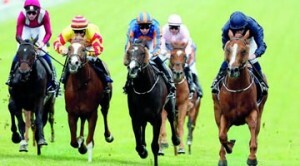 The colt was backed at long odds at Epsom and ran creditably to hang on to third place in a bunched finish. He had previously looked tapped for toe in the Sandown Classic Trial when third to Sugar Boy. That horse reopposes on Saturday and has since been purchased by another member of Sheikh Mohammed’s family, Sheikh Mohammed Bin Khalifa Al Maktoum. Libertarian also finished behind Sugar Boy at Sandown but he suffered major interference that day and the form can safely be forgotten. He is far better judged on his victory in the Dante Stakes at York and is a strong second favourite at 7-2 with Bet365. Aidan O’Brien has left only Festive Cheer to accompany Ruler Of The World beaten only two home at Epsom. He was previously run with promise when third at Longchamp and is likely to be ridden more prominently at the Curragh. John Oxx is represented by Little White Cloud who was second to subsequent Royal Ascot winner Leading Light in the Gallinule Stakes last time out. Jim Bolger relies on Trading Leather who was beaten by Libertarian at York before finishing third to Magician in the Irish 2000 Guineas. He won a listed race in good style on his most recent start and is expected to give a good account of himself here. The field is completed by 100-1 outsider Ralston Road who failed to stay the two miles of the Queen’s Vase at Ascot and drops back in trip.